Last night Chris Metzen, the Senior Vice President of Story and Franchise Development with Blizzard, was blowing up twitter answering random “x or y” tweets (he didn’t get to my ninja turtles vs dungeon boss question, unfortunately). One of his responses (shown after the page break) may have incidentally revealed something larger than the community has realized so far. 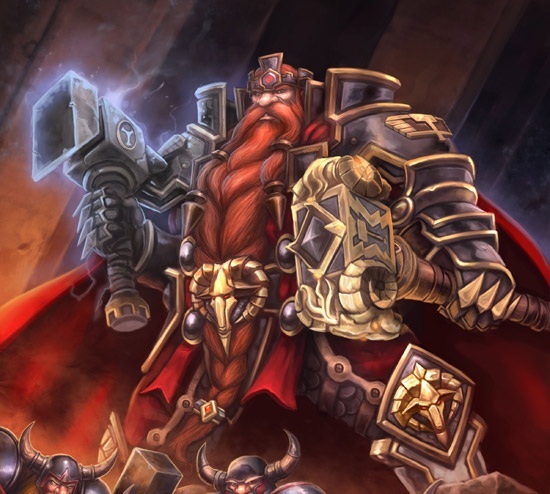 For those who are unaware, Magni Bronzebeard is the elder of the 3 Bronzebeard brothers and is the rightful King of the Dwarves at Ironforge. Unfortunately, after messing around with some titan relics somewhere during patch 4.1 in Cataclysm, he has been turned entirely to diamond. This left a void for his estranged daughter, now leading the Dark Iron Dwarves (see: bad guys) to come take a place of power in Iron Forge. But, Chris Metzen’s tweet may have hinted that Magni is coming back. “@nateblags: @chrismetzen bran, muradin, or magni? lets see some dwarf love!”Magni! …was there just a tremor? What do you think? Is this just a lore-tease or an actual hint of things to come. At this point, I’m predicting that we see a return of Magni before the end of the expansion or at the very latest the very beginning of the next. Also, with him being infused with power from a titan relic all this time, you can bet he’ll come back with some insights into the titans and their workings that haven’t been revealed up to this point. This entry was posted in News/Updates and tagged 4.1, bronzebeard, cataclysm, chris-metzen, diamond, expansion, magni, magni-bronzebeard, metzen, news, reveal, titan, tweet, twitter, warcraft, world of warcraft, wow. Bookmark the permalink. One Response to Magni Bronzebeard Returns?